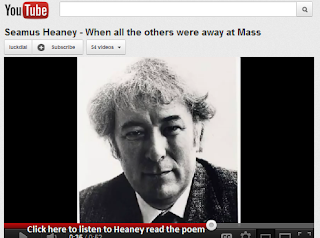 Heaney gives us such little detail, he leaves so much unsaid, but that is the beauty of the poem: the silences. Everything you need to know about their relationship is there in these few lines: she is the provider of food, the giver of life, he the adoring son, coming to aid her. We wonder why they did not have to get mass. Had she already been, having gone at the crack of dawn, or was she or he at home sick? Had she been nursing him back to health? This might be why, later in the poem as his mother is dying, with some sickness of her own, that he returns to this memory. While the priest beats out the prayers of the dying, it is the silence of that lost moment that he most recalls, that active, vital mother that he most yearns for. I love that it is that most Irish of vegetables, the humble potato, that binds this silent Irish boy and his mother so closely together; the 'potato' and the 'water' being so symbolic of domestic Irish life. So, for those of us who have sons and who know too well the beauty of those quiet moments and the simple joy of doing things together, Heaney's words echo like a truth always known. So, for all those women everywhere, mothers (sisters, daughters, carers, nurses) who keep the world in hot dinners, clean linen, warm hugs, long conversations, bright smiles, empathetic tears, and future generations... this poem is for you. Happy Mother's Day! Taken from 'In Memoriam M.K.H., 1911-1984' by Seamus Heaney.